Wow - did this year go by fast or what? We had a crazy year which is why it seemed to fly by. Most of it was very good though so I'm not complaining. Today's share is a New Years Card, made with this lovely foiled kraft patterned paper and a scalloped front card. I die cut the numbers from kraft card stock and inked the bottom to mimic the colours in the patterned paper. 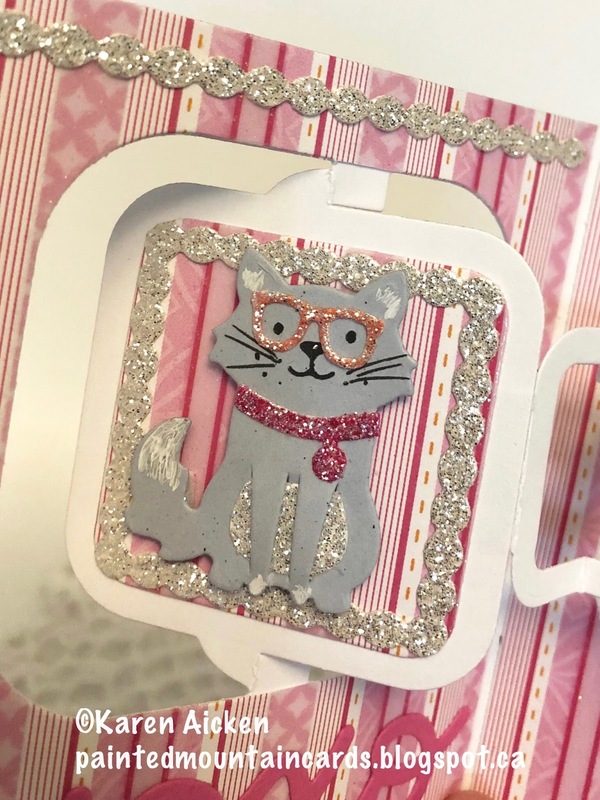 I really like this scalloped card base by Stephanie Barnard for Sizzix and don't use it nearly enough. That will be remedied in the New Year! In fact, this is the first time I used the 'drop in' CHEERS portion of the die set - there are lots of accessory dies included that will be getting more love in 2018 as well. Wishing you all the very best in 2018 -- Happy New Year! I have a humorous card to share today. I was down with a cold just before Christmas and I think it affected my mo-jo a little. This card did not turn out like I wanted it to, and if I were to re-do it I would change a couple of things. But it was a nice way to relax and working in my craft room always makes me feel better. I took advantage of Riley & Company's Black Friday Sale and purchased a few fun sentiment stamps to add to my collection. I already have several, but haven't used them in awhile. Going to remedy that in the New Year! This Ethel stamp was also one of my new purchases from Riley and Company. She is so fun! Here I added horn rimmed glasses, which are from Karen Burniston's Tiny Accessories 1 die set. The stamp is actually a three line single image that I cut into two pieces so I could use the first line on the front and the remaining lines inside. The Sunburst panel was die cut from one of my Magical Shaker/Colorburst water coloured panels, but when I went to toss the cutaway pieces, I noticed they all had a cool stitched line around the edge. So I added them back in, but popped them up on foam tape. I stamped the wine glasses and added a few bubbles with a marker. It's Flip-It Friday here on my blog, and I have a New Years Flip-Its card to share today. This Flip-Its die is the one that started my enthusiasm for Flip-It cards several years ago and I still like to get it out to play with. It's a Big Z die - not a wafer thin die. Which means it cuts through lots of different mediums! Here though, I used a crease pad and cut it from black card stock. The Cheers die was cut three times - twice from white card stock and once from black. I adhered one on top of the other with white on the bottom. I like how it raises the word up from the surface, and also makes it nice and sturdy to adhere. Doing it from two colours gives it a slight 'off-set' look as well. I am sure getting a lot of use out of those Stampin' Up foil snowflakes! I picked up a set of super sparkly embossing powders at the Mesa Rubber Stamp show a couple of years ago - and it is quite effective on dark card stocks. I wasn't sure how this black one would work on the black card stock but it's SO pretty! I wanted to play with the Charm Accordion and the new Cat & Dog animal dies by Karen Burniston. One thing led to another and this is what I came up with! The Tiny Accessories 1 is SO much fun. I was able to use some small glitter paper scraps to cut the spectacles from. The Charm accordion makes a sweet little two page card - if you want more pages you can just cut more - it cuts them two at a time which is very handy. For this one though, I wanted a solid front. I simply cut a rectangle slightly wider than I needed and scored a line down the excess. A little double sided tape and I was able to hinge the solid panel to the accordion and I had my third page. I had just made a Tag Book Pop-Up card and the dies were still on my stamping table. I wondered if the beaded frame and strip would work with the Charm Accordion and YES they DO! In fact, at the same time I was making my card, DT Teammate Kelly Booth was making a holiday card and she had the same idea. Great minds and all that, ha ha. 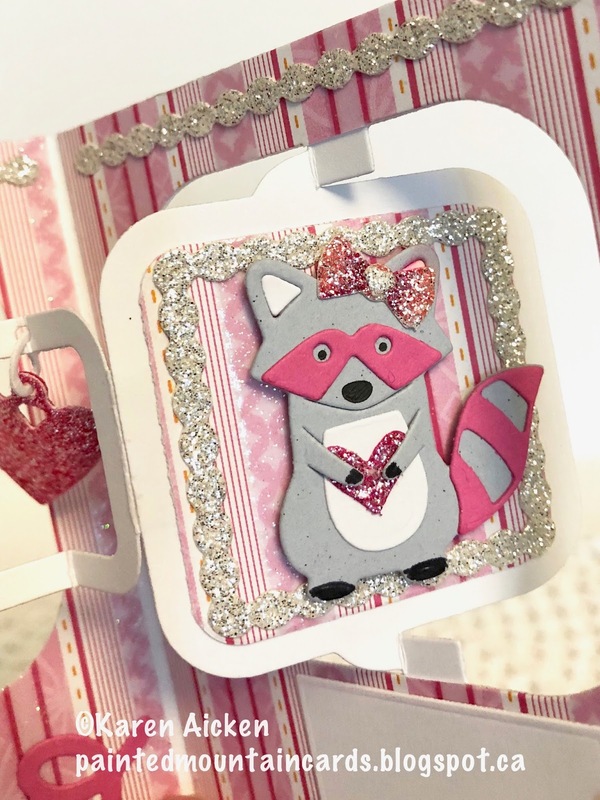 When it became obvious the card was going to be a Valentine, I decided to add a pink mask and tail to the little racoon. Honestly, this little character just makes me smile. There are also two tiny glittered hearts - one on the dog bowl on the card front, and one below on the racoon's bow. These are the fall away pieces from the heart charm. I cut two charms and adhered them back to back so no matter how it dangles you get to see the glittery goodness. All of the glittered elements were die cut from the same white glimmer paper, and I added colour with a Copic marker. Our Son-in law's parents, sister and her husband were visiting from Israel back in June. We had them all out for lunch and of course I wanted to have a little something for the ladies. I made one extra for Naor's Aunt, who I had met last year and who is a crafty gal herself. They were happy to pack it back to Israel for her. I love this Handled Pillow Box die from Elizabeth Craft Designs - it makes up quickly, but when you use a pretty card stock can really look elegant! I chose some pearl embossed white patterned card stocks in a couple of different patterns from the stack for the pillow box and flower overlay. The flower dies (solid and overlay) are also from Elizabeth Craft Designs and I had the silver sparkly large brads in my stash. The solid flowers were cut from silver pearl card stock. I also added a vine from the Flower Pot Pop-Up by Karen Burniston behind each flower and tied silver sheer ribbon around each handle. Inside? Some of my handmade lip balms ... when people come to Alberta they usually find it quite dry so I know these lip balms were put to use right away. Just a little somethin' somethin' in a pretty package to let them know how much I care about them. You'll never meet nicer people! For many MANY years, I worked ahead on my holiday cards. It started when I was on a roll one year and finished far more than I needed. I put them away for the following year, so when it was time to work on my holiday cards I could do so with no stress as I knew mine were done and I was working on the ones for next year. I loved working on my cards during the busy season as card making is my stress relief. I also loved not HAVING to work on them. Things changed this past year though, when I decided to work on my holiday cards throughout the year. I have these three to share then I promise no more Christmas cards for a month or two. But I will be sharing holiday cards throughout the year because I love making Christmas cards! I also really like having them all done when it's time to get them ready to send out. For these three, the card bases and inserts were in my I'n Progress bin', with the acetate embellishments ready to be attached. I added some word printed washi tape below the acetate pieces and the card fronts were finished. The insides were also cut and in the 'In Progress bin', and I was poking around in the bin and found these Cricut cut embellishments as well. So I used them here and finished off the cards with die cut labels and stamped greetings. I stamped a little pine tree from Wild Whisper on each bottom label. Out of the bin and sent out this year. Woot! I certainly did well working out of that bin this year, and also using up a bunch of patterned paper packs that only had a little bit left. Hopefully there will be room in the drawer for a new paper stack next year because of it. I have had a couple of blog posts scheduled during this hectic season, so I can spend time with family and friends. I do want to wish you all a very Merry Christmas, for those of you who celebrate. Today I have a Pop-Up card with a sleigh inside, which seemed fitting for the day. The patterned paper has gold foiled bits on it and I added some gold foil snowflakes as well. Inside I used the Katherine Label Pop-Up to animate Karen Burniston's wonderful sleigh die cut. A flying sleigh!! ... and the sleigh is stuffed with die cut gifts and a few more snowflakes. This holiday card is one I made for my Mom to send out. I love sparkle on Christmas cards, and these pretty calligraphy trees have red glittered stars. The Merry Christmas was fussy cut from a leftover piece of patterned paper borders, so I adhered it to a red glittered strip. Before attaching it to the card I added a gold foil snowflake. It's Christmas Eve, and I have scheduled several blog posts (including this one) so I can be with family for a few days and not on the computer. I do wish you all a lovely day - whether or not you celebrate Christmas. card size - 5 x 6-1/2", trimmed to 6-1/4"
This patterned paper was cut already and in my IN PROGRESS Christmas card bin, with white scored pieces. Looked like I was going to make some small boxes for chocolates and the patterned paper pieces were to be the lids. Since I now have a couple of treat holder dies to use instead, I put the scored white bases in my scrap bin and used the patterned paper squares to make a couple of nearly identical cards. Gosh, I love this tree stamp and die set. I was so surprised when Stampin' Up retired it! This is not a standard sized card because the patterned paper pieces were already cut and I was working around them. The cool thing about Karen Burniston's Pop-Up dies, is that YOU get to decide on the size of your card! I used the Katherine Label Pop-Up (yes, again) to animate another one of the trees in the set. There are embossed and sparky bits on the paper, which I always like for the holidays. The Katherine Label Pop-Up arm allows your item to raise up and pop-out with lots of dimension. It's such a versatile die! I added bright raised & shiny dots onto the tree with Nuvo Crystal Drops. I love using things up that have been hanging around for far too long and I've been doing really good at that this season. Win win! Patterned paper - My Minds Eye? Card size - 4-1/4 x 4-3/4"
I'm kind of excited this morning, as today we are all going over to my brother's for our Christmas Eve dinner. He found out he had to work on Christmas Eve and was very disappointed as he really enjoys hosting this dinner every year. Thankfully today worked for everyone so he moved the date this year. It's our big holiday meal as Christmas Day is always at our house and very casual with nibbles and appetizers. Onto today's share - I had been having fun with this older Paper Smooches stamp set so used it again here with Karen Burniston's (discontinued) Oval Pull Card. The slot at the top holds the card closed, but when you pull the sides apart you see there is an arm that the mouse, cheese and gift are attached to and they slide across the inside. It's just a little slide, but movement on a card is always fun. Couldn't resist adding a sleigh - I adore this sleigh from the Sleigh Pop-Up set! You can fill it with all kinds of things, too. My posts for the next week will be scheduled, so I can enjoy time with friends and family. When I first got my Pop 'n Cut Dies by Karen Burniston several years ago, I went to town cutting card fronts and inserts. This year I managed to finish off quite a few of the ones I had cut and put in the "Christmas Cards In Progress" bin. I had cut cards from all the remaining 12 x 12 sheets in a package by My Minds Eye, and have been sharing them here them this week. This is the last of the Pop 'n Cut ones. Getting these cards finished and ready to send out was VERY SATISFYING, considering they have been in that bin for so long. It was fun choosing the embellishments and stamps to finish these off as well. The patterned paper has red glittery bits and I used some red glittered embellishments from my stash, as well as other stickers etc and Stampin' Up's red glimmer paper. Finally here are all the cards together. They would have made a nice gift set as they coordinate so nicely. But I didn't go that route, ha ha.